Two Double Points Campaigns have been launched for guests who choose to Live the Remarkable at one of our luxurious properties. The first campaign is the Year Round Birthday Month Double Points Campaign, for guests celebrating a birthday during the month of their stay. The booking and staying period is from now to 31 December 2018. 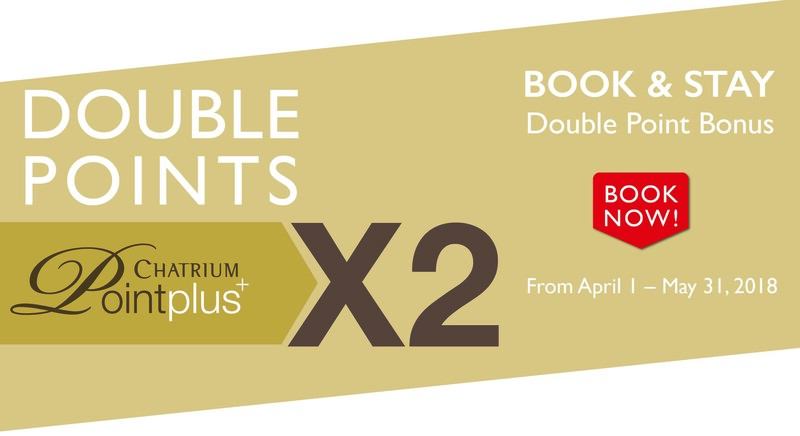 The second is the Double Points Campaign for guests who book and stay during the period of 1 April to 31 May 2018. Chatrium Points Plus membership is free! Visit http://www.chatrium.com/loyaltyprogram-en.html to learn more about you can start earning points for complementary dining and accommodation vouchers exclusively for our loyalty program members. After your stay, double points will be calculated on bookings made directly through the Chatrium website at the daily room rate. Guests staying at Chatrium Hotel Riverside Bangkok, Chatrium Residence Sathon Bangkok, Emporium Suites by Chatrium, Maitria Hotel Sukhumvit 18 by Chatrium, Chatrium Hotel Royal Lake Yangon and Chatrium Golf Resort Soi Dao Chanthaburi are eligible for the Double Point Campaigns. The campaign benefits cannot be used in conjunction with any other hotel promotion or special event. Come join us to celebrate your special day in remarkable luxury, or to beat the heat of the Thai summer at an extraordinary oasis in the city or a breathtaking highland sanctuary. Previous PostPrevious Handily Embrace Iconic Living At Emporium Suites by Chatrium!